Call me a girlie girl. I adore wandering through botanical gardens to gaze at nature’s prettiest petaled creations and breathe in the scent of sweet blooms. And I love little more in life than dining on delicate finger sandwiches and petit fours over a cup of hot tea (pinky finger pointed upwards). So when I saw that Celebrity Cruise Line offered a Butchart Garden and Empress Tea excursion during our Alaskan cruise’s stop in Victoria, Canada—I signed up immediately—somewhat to my husband’s dismay. You might consider me a botanical garden junkie. I am an annual member and frequent visitor of our local San Diego Botanic Garden and often schedule stops at gardens during my family’s travels. 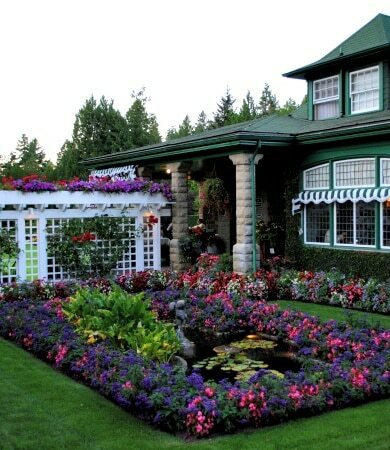 So, of course the renowned Butchart Gardens in Victoria, British Columbia have long been on my bucket list. What started as a family owned limestone quarry over 100 years ago, has been transformed into layer upon layer of flowers, trees and other plants. The namesake Butchart family first sought to create something of beauty from the exhausted limestone pits. What started as a hobby became an international tourist destination after the grounds were gifted to grandson Ian Ross on his 21st birthday. After World War II, he restored the gardens to his grandmother’s intended state and expanded development to include additional gardens as well as outdoor concerts and other entertainment. Today, over a million bedding plants in some 900 varieties provide nearly a million annual visitors with a display of uninterrupted bloom from March through October. A traditional red Torii gate welcomes visitors to the Japanese Garden, which was completed in 1906. 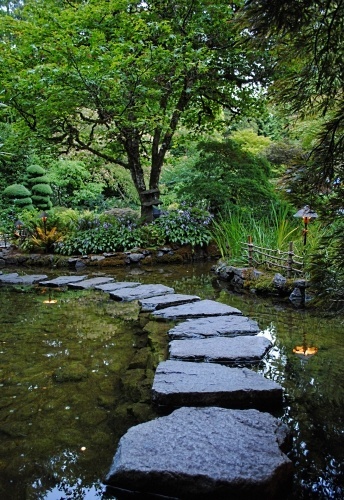 Stone paths, water features and bridges wind through this serene space. Get a glimpse of Butchart Cove from the Japanese Garden before walking down the path to get a closer look at the tranquil boat landing. 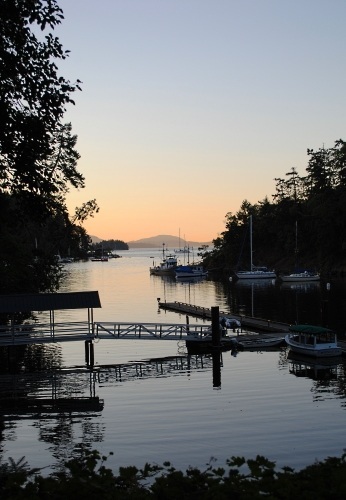 Once upon a time, this was a favorite place for the Butchart family to enjoy swimming, boating and picnics. 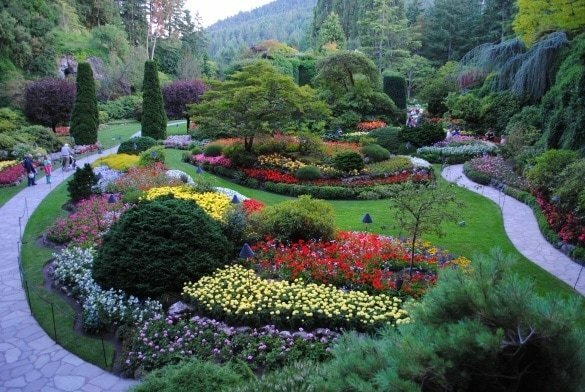 One of the most beautiful, and certainly the most fragrant areas of Butchart Gardens must be the Rose Garden. Here I fell in love with the butter-colored Swan Rose show above. 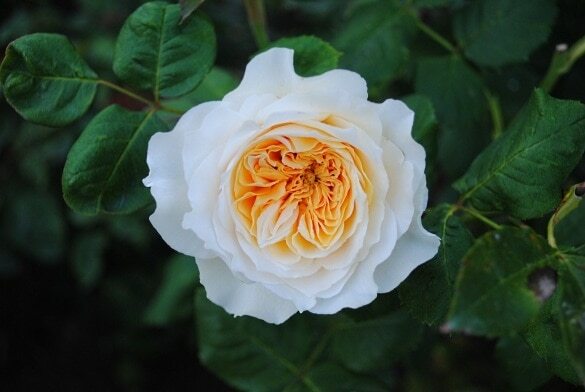 From tiny tea roses to giant rosettes, you’ll find roses of all sorts in this garden, each marked by varietal name. This garden is also home to a frog fountain and wishing well. You’re never too young or too old to enjoy a spin on a carousel, especially one as lovely as the Rose Carousel at Butchart Gardens. 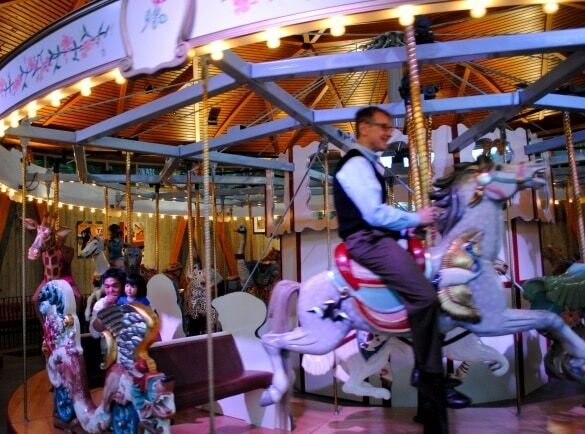 A newer feature, this carousel opened in 2009 and showcases 30 hand-carved animals and two chariots for disabled riders. 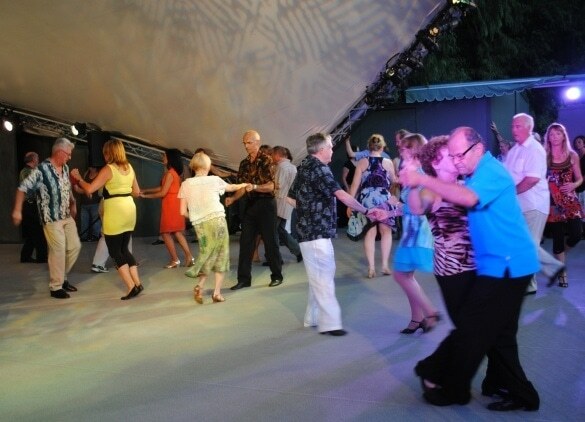 Daily concerts on the Concert Lawn Stage lure locals and tourists nightly during summer. We were regaled by the Chris Millington & Dancin’ band during our visit. The best part was watching couples swing-dancing on the stage. I wanted to linger and join the fun but the tour bus beckoned. On summer Saturday nights, bring a blanket to sit on the lawn and watch a fireworks display. If you don’t have time to follow your Butchart Gardens visit with a trip to the Fairmont Empress for tea, you can dine in the original Butchart family home with a view of the Private Garden at the Dining Room. The Private Garden is the only area of the gardens that has never been open to the public. 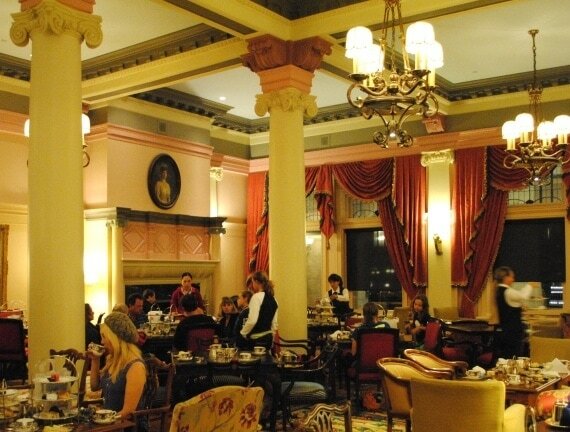 This fine dining restaurant offers lunch, dinner or high tea. For more casual fare, choose the Blue Poppy Restaurant for lunch or dinner. Grab an ice cream cone, or a cuppa and a pastry or sandwich from the on-site Coffee Shop. For me, the highlight was wandering through the Sunken Garden, the original multi-layered garden created from that limestone quarry so many years ago. From tiny white star-shaped buds, sunny yellow spheres, and firecracker bursts of red blossoms to greenery in various shades—the shapes and colors here build upon one another in a most unexpected, yet harmonious way. There’s so much beauty at Butchart Gardens, it can be hard to decide where to point your camera first. In addition to the gardens and features mentioned above, Butchart boasts a Mediterranean Garden, an Italian Garden, and two impressive totem poles carved by artists of the Tsartlip and Tsawout First Nations. Be sure to stop into the Seed and Gift Store to bring a little Butchart beauty home with you. We purchased a hand-painted, flower-bedecked Christmas tree ornament to add to our collection. 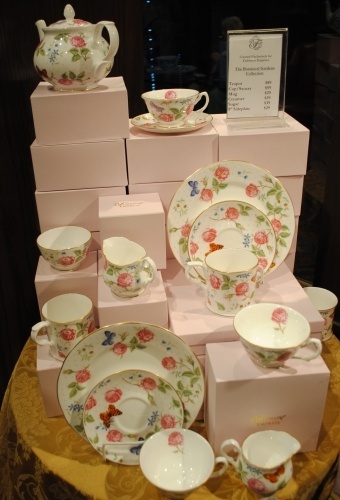 Following our self-guided tour of Butchart Gardens, we and our fellow cruisers set off to find additional beautiful things, this time in the form of delicate pastries and porcelain tea cups at the castle-like Fairmont Princess. With its vine-covered exterior and luxurious pinkety pink interior, girlie girls like me will feel right at home here. Our tea began with fresh blueberries served with a dollop of whipped cream. Next, a three-tiered tray served up sweet and savory treats, including traditional scones with clotted cream, jam and lemon curd. My favorite offering was the miniature pink marzipan covered cake filled with rich chocolate cake and vanilla cream frosting. 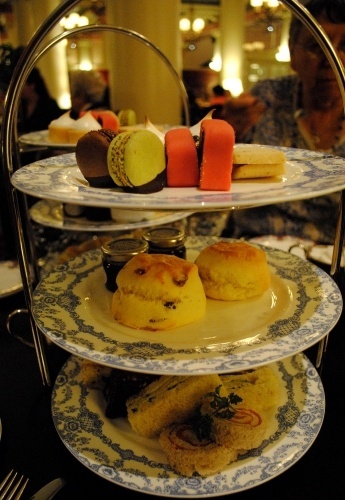 It felt a tad odd to sit down to high tea so late in the evening, but it provided a lovely end to our garden excursion. What about my husband—in the end, was he glad I booked this girlie girl excursion? He said, “I liked the gardens, but I wish we had more time. We were rushing around. As for the tea, I don’t care about that. It was nice, but it was for you.” There you have it, fellas. As the saying goes: happy wife, happy life. I would have loved to bring my children along to both the Butchart Gardens and Empress Tea, but unfortunately our ship didn’t dock in Victoria until after 6 pm, and we didn’t want to burden other excursion-goers with our over-tired children. Instead we left them on board Celebrity Solstice in the kids club. They had a ball playing games and watching movies in their pjs with the other children until we collected them around midnight. This was the final night of our eight-day cruise, which meant we had to get up far too early the following morning to depart the ship. We would pay the price for this late night for the duration of our vacation, which continued by land to Vancouver. Still, it was worth it to wander the incredible Butchart Gardens and dine on delectable mini cakes at the swanky Fairmont Princess. Better yet, I wish Celebrity Cruises would extend their itinerary by one day to allow cruisers to spend a full day exploring the town of Victoria and the rest of Vancouver Island. Which would you enjoy more, wandering through Butchart Gardens or sipping tea and eating scones at the Empress Tea? Let us know in the comments below! A Note from The Travel Mama: Celebrity Cruise Line hosted my family during our seven-night Alaskan Cruise aboard Solstice. We paid for all of the shore excursions ourselves. All opinions are mine, as always. All photos by Colleen Lanin. That sounds like a perfect day in Victoria! I have only been once and that was almost 20 years ago. We were visiting Vancouver and took the ferry to the island for the day and it simply wasn’t enough time. I would love to go back and spend a couple of days to see more of Victoria and Vancouver Island! 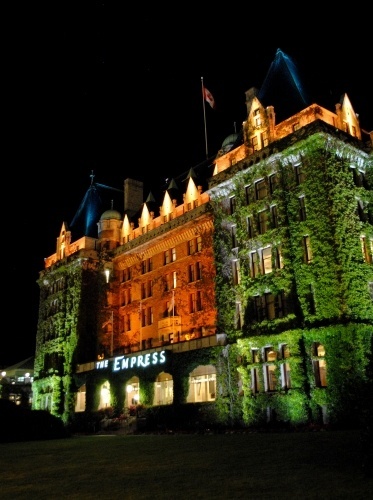 What a great story Colleen – thank you for this post on The Gardens and our friends over at The Fairmont Empress. We are glad you enjoyed your visit to our corner of the world – come back any time! LOVE your gardens! I hope to return someday. Thanks for swinging by Travel Mamas and for leaving a comment! 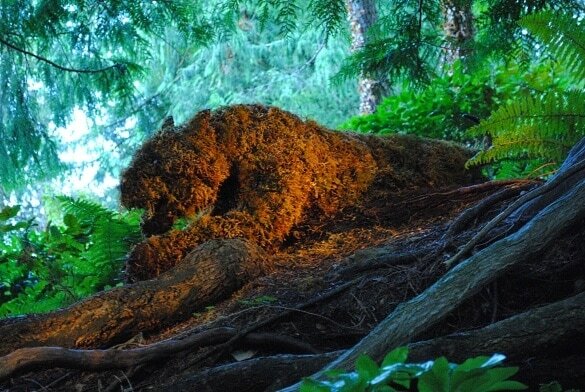 I am stunned with “Sturgeon Fountain at Butchart Gardens” & “A living sculpture on the prowl at Butchart Gardens” – I should check out those places soon. So much of astonishing photos in one post. I love the fountain, stone steps, cove, sculpture and all of them. Surely it is a journey to remember for life time. I am sure “girlie girl” should have a wonderful time. 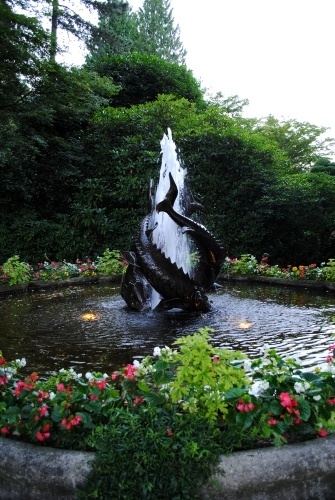 There really is so much beauty at Victoria’s Butchart Gardens – I hope you get a chance to visit soon! How old were your children on that cruise? Do you know what the age restriction (if any) for High Tea? My kids were 5 and 8 when we sailed Celebrity in Alaska. There were no age restrictions for High Tea that I was aware of. Usually when you sign up for a cruise excursion, it will tell you if there are any age restrictions.